This updated unit has been remodeled to accommodate an open floor plan complete with a fully applianced kitchen and granite island/breakfast bar. The living room and 2 bedrooms have sliding door access to the deck which runs the length of the unit. Hardwood flooring flows throughout the unit and into the master bedroom which features two closets and a 3/4 bath. There is an additional full bath with laundry in the unit. 1,216 sq ft of living area. The deck contains an outdoor storage closet perfect for seasonal items. 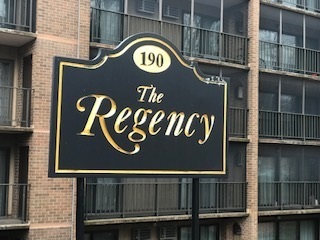 The Regency Condominiums boasts an in-ground pool, club and exercise room and elevator. There is one parking spot located close to the rear entrance facing Winthrop Street and plenty of public parking in the area. Professional Photos Coming Soon!! Professional Photos and Interactive Floor Plans Coming Soon!